The OW Lee Creighton Modular Table is designed to be used with the armless chairs to create a table/arm rest. 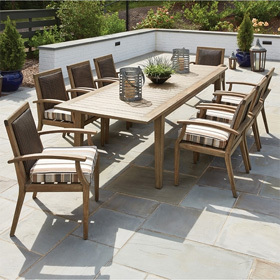 The unique 18.5" height of the table makes this as high as the arm height and allows you to create a custom sectional configuration on your patio. Unique 18.5" Height allows to be used as armrest and table. Designed to be used with modular pieces from the Creighton Collection. 30"L x 30"W x 18.5"H 77 lbs.